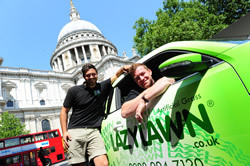 Find out more about the artificial grass specialists by visiting www.lazylawn.co.uk or calling Ryan on 020 8994 7120. Alternatively, stay up-to-date with the latest news at www.facebook.com/lazylawnlondon or by following @lazylawn. West London home owners can discover how to fake it in the garden as the UK’s oldest and biggest artificial grass supplier has landed in London. Home owners in London have been found to spend the least amount of time in their gardens compared to other regions in England, an HSBC garden survey revealed in 2012; Londoners spend an average of 74 days per year in their garden, while those in East Anglia spend the most time in their outdoor space, clocking up 112 days in their garden every year. Ryan Adams, Sales Director for LazyLawn London, comments: “We’re on a mission to help London home owners spend more time enjoying their gardens by introducing them to LazyLawn. Loved by Amanda Holden, Gok Wan and Alan Titchmarsh, LazyLawn is the go-to brand for artificial grass and the latest garden must-have for home owners in London. LazyLawn has also been used in Selfridge’s famous window displays, the Big Brother garden and was the first fake grass brand to make an appearance at the Chelsea Flower Show. LazyLawn have invested a six figure sum in the new office and show gardens, based within a former signal box on Sutton Lane North, where 150 square metres of product has been used to create a number of inspirational gardens. Home owners across the UK are already joining the LazyLawn revolution, with demand for its grass growing by 20% over the last 12 months as more and more people opt for a no mess, no mow lawn. Low maintenance – for those who want to spend more time enjoying their garden than maintaining it, LazyLawn promises a hassle-free way to a summer ready lawn. No mess – LazyLawn’s no mud, no mess guarantee ensures children and pets can play in the garden whatever the weather, without bringing any muddy footprints inside. Hay fever haven – as 95% of hay fever sufferers are allergic to grass pollen, installing an artificial lawn could help to reduce symptoms and allow people to reclaim their gardens. The LazyLawn ‘W’ shaped Wonder Yarn – the UK’s number one selling artificial grass product features pioneering technology that enables it to recover after activity, as the ‘W’ yarn forces the blades of grass to stand upright and ensures a year-round green lawn that always looks good. Kind on the environment – LazyLawn requires no watering, no mowing and no fertilisers, making it a greener option for those wanting the perfect lawn.